I bought some beautiful swiss chard from Elizabeth Telling last weekend. I have never cooked it myself before. I discovered a Peter Berley risotto recipe in Fresh Food Fast, that made me drool and included several of my favorite ingredients, beets, ginger and barley. I told my neighbor all about the recipe. I made a trip to Wholefoods to buy the only two ingredients I didn’t have (golden beets and goat cheese). I started cooking…… and then realized that I hadn’t read the recipe quite closely enough. Somehow I had missed the word ‘pressure cooker’. Sigh. No pressure cooker. Luckily I had quick cooking barley and by chopping the beets up smaller than suggested in the recipe and cooking them longer, I managed to overcome my equipment shortcomings. I also added the liquid more gradually, more like a traditional risotto. Probably should have cooked the beets a couple of minutes more. 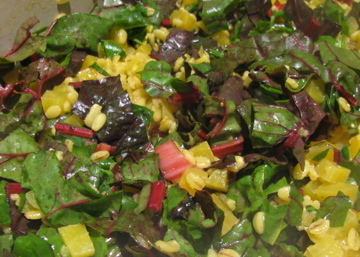 The photo is after adding the chard and before adding the goat cheese. 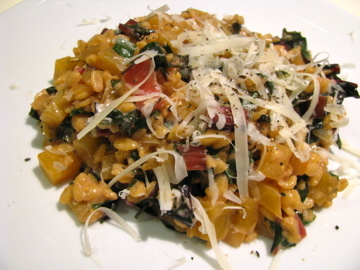 The ingredients were onion, ginger, fresh rosemary, golden beets, barley, swiss chard and goat cheese. It has a really creamy texture and very earthy flavor and was beautiful. I think if I make it again I would add some acidity and maybe use bouillon instead of just water. I thought that the goat cheese and ginger would give the risotto sufficient kick, but it was a little mellow. In the picture above it is served with fresh grated parmesan as suggested by Mr Berley. 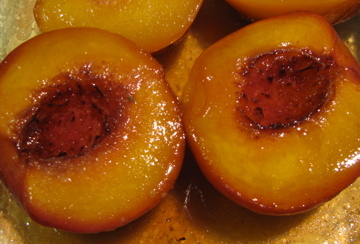 Dessert – baked peaches with brown sugar, vanilla and butter. Delicious. My tomato plants are prolific. 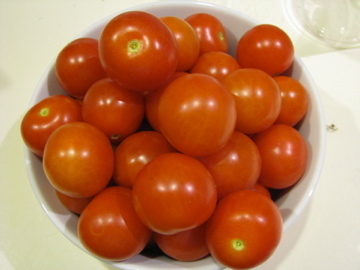 I roasted the tomatoes with onions, garlic and fresh herbs and put them in the freezer for a rainy day.